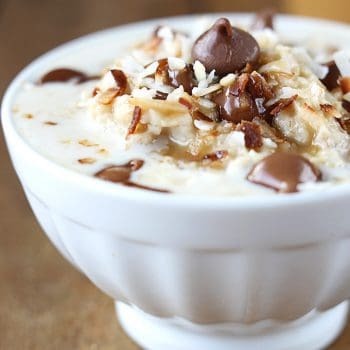 Hot n' creamy oatmeal with toasted coconut, gooey caramel, and milk chocolate chips - a hot comforting breakfast inspired by your favorite girl scout cookie! In a small pan, toast coconut flakes over medium heat. Stir constantly until lightly browned (watch closely or they will burn!). Set coconut flakes aside. If using regular non-instant oats, combine oats, milk, and vanilla in a microwave safe bowl. Stir. Cook on high in your microwave 2-4 minutes, stirring periodically. Stop when oatmeal is cooked to your desired consistency. Top oatmeal with caramel sauce, toasted coconut, and chocolate chips. Add a little more milk if desired for an extra-creamy taste! *You can use your favorite caramel ice cream topping, or about 2 tablespoons of melted caramel such as Kraft caramel bits + 1 tablespoon milk or heavy cream.